Tri�cia Skin�ner is an author of pas�sion�ate dark fan�tasy. She began her writ�ing career as a busi�ness reporter and wrote for The Detroit News, Investor�s Busi�ness Daily, MSN, and The Hous�ton Chron�i�cle. 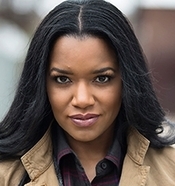 Raised in Detroit, Tri�cia grad�u�ated with a BA degree from the nation�ally acclaimed Jour�nal�ism Insti�tute for Media Diver�sity at Wayne State Uni�ver�sity. She also earned a Mas�ters of Lib�eral Stud�ies � Cre�ative Writ�ing degree from South�ern Methodist Uni�ver�sity. Diver�sity in genre fic�tion is dear to Tricia�s heart. She is rep�re�sented by Lau�rie McLean, co-founder of Fuse Lit�er�ary Agency. When not writ�ing, Tri�cia can be found read�ing, lift�ing weights, or geek�ing out over games, movies, and music. She has a Tom Hid�dle�ston obses�sion, and she is Team Vader. Her fam�ily includes three Great Danes (so far).